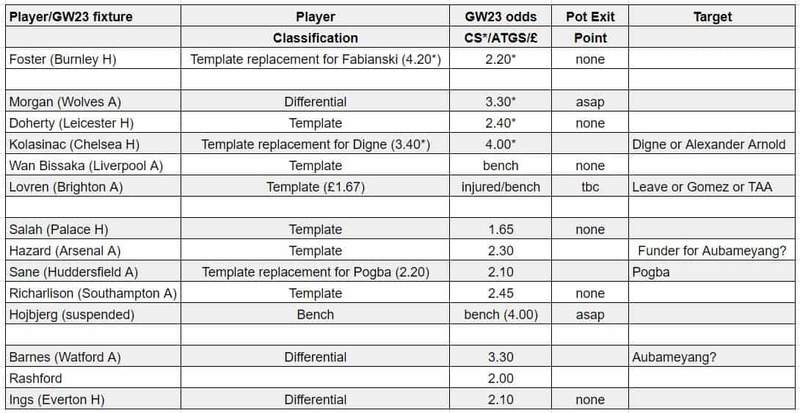 I wrote in more detail about GW22 in my early FFGeek team article if you want more info but here I’m going to be brief. A bad week where I lost 22k in OR to 142k and are now 70 points or so from my last seasons rank of 17k. 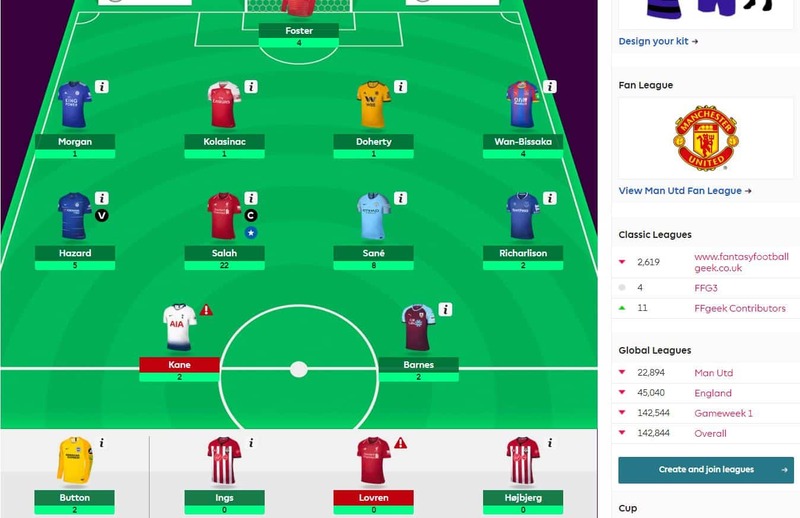 My week was killed by the template of Digne 12 points and Fabianski of 9 points vs my team of Kolasinac 1 point and Foster 4 points. Plus the injury to Lovren saw the template Liverpool defence averaging 7 points against me. That was a swing against the template of 23 points. 1 free transfer and £0.6m in the bank. I can’t see a green arrow coming out of this week. The only thing that might save me is the amount of hits people are taking . Digne at Southampton has the advantage over Kolasinac at home to Chelsea and really Ings has a key part in this as wiping out the Everton clean sheet is vital as Digne is a double figure score waiting to happen if he gets a clean sheet. The last template replacement I feel confident of at least matching is Sane over Pogba. However that assumes Sane starts which you can never take for granted. The Liverpool clean sheet against Palace should be mitigated to a certain extent by the “injury” of Alexander Arnold and the resulting sales. However I’m not hopeful for returns from Barnes or Morgan to pick up any slack. This is also one of those weeks where I have 3 attacks playing defence which pretty much rules out 3 players returning. Kolasinac v Hazard, Foster v Barnes and Salah vs Wan Bissaka although Wan Bissaka will be buried on the bench at least. I suspect Rashford will be template when the gameweek opens so will be a neutral effect on the team. So this week in summary I’m pinning my hopes on Sane (again!) Ings and Foster and worrying over Pogba, Digne and Fabianski. I could also do with Man Utd losing a clean sheet as I suspect that will be close to template as well. So the only transfer I have done is my free and that’s Kane out Rashford in. I did think about Shaw for Lindelof but paying 4 points to get 4 points back, hopefully, didn’t seem wise. I also thought about Robertson but his price doesn’t really fit my team structure and Alexander Arnold or Gomez could easily both be in my team when fit. 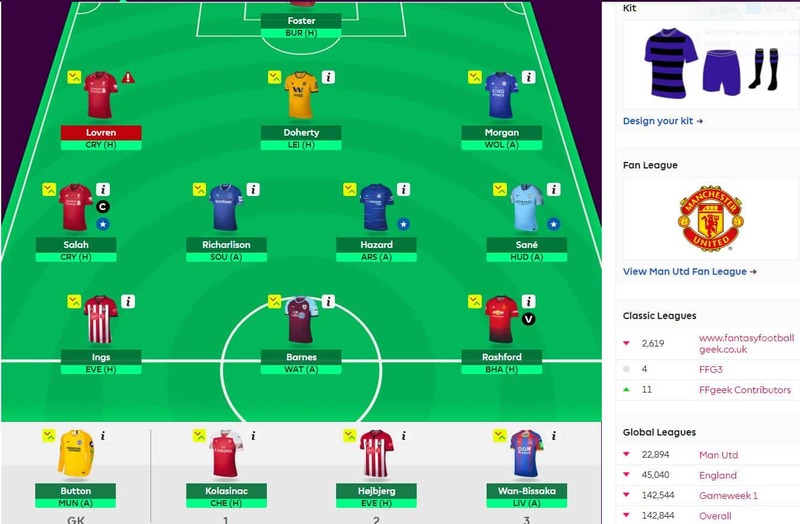 There is a theory that 4 point hits for defenders can pay off if there’s no prospect of doing it for free in the coming gameweeks as you have other things you have to do. That is the case for me as I can’t see me getting Shaw/Lindelof for free anytime soon but it still hasn’t swayed me. It did cross my mind to do Hazard to Pogba for points protection for -4 but surely it hasn’t come to Hazard falling that low that you’d pay 4 points for him to get out of your teamwhen he faces a pretty dodgy defence next to say the least. I know he’s been terrible 2 of the last 3 games and the reasons put forward for that but it seems a stretch to me. These could be very prophetic famous last words btw I’m very aware. So I could have easily done a -8 with Morgan out for Shaw/Lindelof/Robertson and Pogba in for Hazard but I didn’t and we’ll just have to see how it all falls. So the transfer is Kane out for Rashford. See my initial summary of the blanks and doubles article. So with Everton v Man City going to be removed probably outwards I have Richarlison and Sane to think about. The one of Burnley v Spurs and Chelsea v Brighton will be moved so I will lose 1 of Barnes or Hazard. I’ll be endeavouring to do more work on the weekend with hopefully some hypothetical scenarios which may help crystallise a more certain plan. The only real issue is Kolasinac vs Hojbjerg as a starter which shows how tricky things have become in my team that I’m seriously considering starting Hojbjerg. I have gone with Kolasinac as even if the clean sheet is a bit of a remote possibility he does always have some assist potential. I’ve put Lovren in the starting lineup in case he does an Alexander Arnold type rise from his sick bed. Doherty, nasri and shaw. Who to start ?